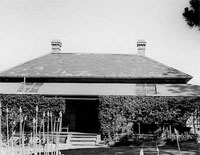 10.30am MULBERRY HILL HOUSE (Melways 107 C2) – 1 hour from Melb. Golf Links Road, Langwarrin South – Guided Tour & Morning Tea. A fascinating home built in 1880’s, home of Joan & Darrell Lindsay. 2.00pm Film and guided tour of BALCOMBE HOUSE at the Briars, containing an extensive Napoleonic collection, commemorating Napoleon’s 8 weeks residence prior to exile on St. Helena. 3.00pm AFTERNOON TEA at the List’s home, 7 Buxton Crt North, Mt. Martha, just around the corner from the Briars. The Friends of Rotary now have their own distinct badge, and meet from time to time for their own activities. They are most welcome at any meeting or function held by the Rotary Club. Please obtain regular information from www.rotaryrichmond.org.au or ring Sue Bolton, Secretary on 9571 9613 if you need a copy of the Club Bulletin posted regularly. �Fascinating!' �So interesting!' �Quite amazing!' �A marvelous look at our own local history!' - some of the comments heard repeatedly when the Friends of Richmond Rotary, led by Jenny List, hosted a tour of two National Trust properties last Thursday, 29th November. They included, Mulberry Hill, Langwarrin South, a delightful American colonial style residence. It was built in the late 1920's and has commanding views of Westernport Bay from the front of the property. Morning tea was enjoyed in this rural setting, under the original, old, gnarled, Mulberry tree. The home of noted artist Sir Darryl Lindsay, brother of Norman Lindsay, and Sir Darryl's wife, Joan, the Lindsays' personal collection of amazing artworks and Georgian furniture are an outstanding feature of the house. Lady Lindsay is best remembered as the author of the Australian classic novel, Picnic at Hanging Rock. The FoR convoy then moved on to The Briars Park, Nepean Highway, Mt Martha, where we tucked into a scrumptious two-course lunch served in Josephine's Restaurant, situated in the original old hay sheds building. A National Trust guided tour followed of The Briars, an 1840's Historic Homestead and one of the Mornington Peninsula 's oldest properties. It houses the Napoleonic Collection, items of National Trust furniture, historic photographs and artifacts. The surrounding farm buildings contain an extensive collection of historic farm machinery. The party of 22 included 10 Rotarians, 9 Friends and other personal friends. The tour ended at the seaside home of Jenny and Brian List, in Mnt Martha, (not classified as an �historic home' for at least another 100 years!) The raffle was drawn as we tucked into afternoon tea. Presentations of thanks were made to Jenny and Brian, her erstwhile personal secretary! To top off another fabulous Friends event, add in fellowship, fine food and $400 in funds raised for the Orphans of Zambia! At the end of this warm and engaging �historic homes' day, we left behind the glorious country-side for the busy highway to home and suburbia. 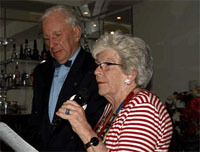 On Monday, 25th June, our Club held its meeting at a French Restaurant in Richmond, to honour our new President for the 2007-2008 Rotary Year. We welcome Jean Marc Berthier and his partner, Flora Lee, and look forward to a very successful and rewarding year. We now need to confirm our bookings for accommodation for the Conference period as well as the 2 day Pre-Conference Tour. The Conference will involve 3 nights accommodation in Shepparton to be allocated by “The Information Centre” (13 - 15 March, 2008). The Pre-Conference Tour - An interesting daytime program is being arranged.